The Basement Renovation works are: clean and safe, fast, at a competitive price and of high quality. In most cases you keep living in the house during the renovation project and work and we are aware that special attention is needed to preserve your living environment by completing the work properly and safely on schedule, respecting the budget and doing quality work. Noise, dust, traffic, storage of materials, are even more factors that cause us to take concrete action measures so that they do not come to bother you during the renovation project works. 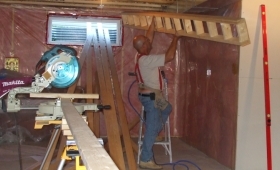 Basement renovation project work minimizes the impact to your home. Cleaning during and after each working day helps to maintain a serene work environment. For safety reasons it is very important to clean the basement and passage so that no remaining residues may injure the occupants. To prevent the spread of dust during the renovation project work, the central ventilation system is closed and the renovation project work is done with the basement door closed and in other open areas surrounded by dust screens. The renovation project work schedule is coordinated to enable you to have the most peaceful family life as possible. Basement Renovation adapts itself to your schedule. We take great care to ensure that the delivery of materials is on time so as not to delay the timing of the project in the basement. If you have opted for a fixed price contract, you do not have to worry about the price of the renovation project work. However, if you chose to use our service work at an hourly rate and materials, we will let you take advantage of our large general contractors’ discounts on the materials of your basement renovation project. When it comes to attention to detail and finishing Basement Renovation is outstanding. For finishing work we hire plasterers, painters, carpenters for woodwork and cabinetmakers who are real perfectionists. All our contractors offer a warranty program for all project and work. With Basement Renovation you are in good hands.